To perform Line Sizing for a single stream or a few streams, the Line Sizing Analysis can easily be added to the stream(s) of interest. However, if Line Sizing is to be performed for all streams in a Project, or for a large number of selected streams, it can be time-consuming to add the Analysis to all of the streams of interest. Significant time savings can be realized by using a User Defined Report Template to perform the Line Sizing and generate the report without having to add an Analysis to each of the streams. Although default values are provided for the parameters in the Line Sizing report template, the template may be modified if desired. 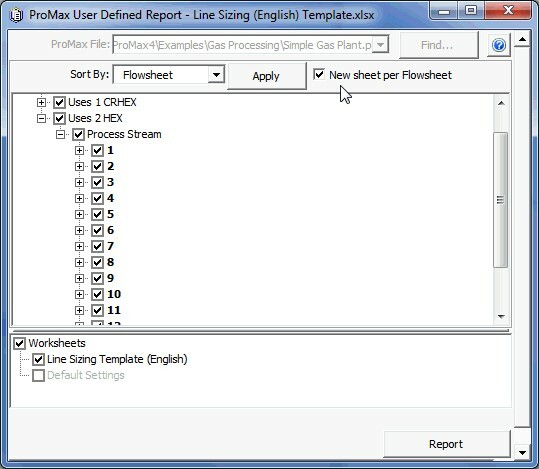 The Line Sizing Report can be conveniently generated from the Report dialog in ProMax, or from Excel® directly via the User Defined Report tool as described in the Help topic “Generating a User Defined Report Using a Pre-Defined Template.“ Note that if the Line Sizing report is generated directly from Excel, Line Sizing Analyses are automatically added to all streams included in the report. The ProMax file can then be saved to preserve the Line Sizing Analyses if desired. Go to the Report dialog in ProMax. In Visio® 2010, 2013, or 2016 click "Report" in the ProMax Ribbon Bar. Select the "Template" option at the top right of the Report Dialog. Click the OK button at the bottom of the Report Dialog. The "ProMax User Defined Report - Template Workbook Selection" window will open. Click the arrow to select "Line Sizing (English) Template.xls" or "Line Sizing (Metric) Template.xls" from the drop-down list. Click the OK button. In the ProMax User Defined Report - Line Sizing dialog, select the streams of interest from the tree. If you have multiple flowsheets, select the New sheet per Flowsheet option at the top of the dialog to have a separate Excel sheet for the Line Sizing on each flowsheet. Click the Report button in the bottom right corner of the dialog to generate the report and specify the location to save the report. Open the Line Sizing (English) Template.xls or Line Sizing (Metric) Template.xls file found in C:\ProgramData\Bryan Research & Engineering Inc\ProMax4\Examples\AddOns\Excel\User Defined Report\en. Click the Default Settings tab. Edit parameters such as Allowable Horizontal Linear Pressure Drop for the various phases, Maximum Velocities for each phase, Pipe Schedule, etc. as desired. "Save As" a different filename. If you place the new template file in the same folder or the My Documents -> ProMax folder, the template will automatically appear in the list of available templates when generating a report through the ProMax Report dialog. If you save the template in a different location, you must browse to find the template later.